In a couple of prior postings I’ve noted that Out West when it gets warmer, we have a tendency to drought, and when it gets colder, we have a load of rains. There was a “Mega-drought” in California during the Medieval Warm Period, for example, and we had a severe bit of flooding in 1861 when things were still cold post Little Ice Age. So what does Lake Mead have to say about what is happening now? Wednesday, Aug. 17, 2011 | 2 a.m. Yes, that’s Last Summer. We’ll have to watch this summer to see if we have a repeat. But as my last article on Lake Mead was from before the rise started, it is a good idea to establish that “we have shifted” and how much. Then remember to watch that lake this summer. A wet winter in the Rocky Mountains has translated into more water in Lake Mead, pushing the lake’s elevation to its highest point since 2009. The lake’s surface level has risen nearly 30 feet to 1,110 feet after hitting a low in November. Projections have the lake rising another 40 feet over the next year, helping stave off a potential water shortage. This year’s surge is being attributed to “substantial snowpack” in the Rocky Mountains, which led to more water running into Lake Powell, which lies on the Arizona-Utah border upstream of Lake Mead. According to Bureau of Reclamation spokeswoman Rose Davis, excess water from Lake Powell is being sent to Lake Mead under conditions established in the Colorado River Compact. Lake Mead’s elevation had plunged nearly 100 feet over the past decade, as a lingering drought choked the Colorado River. The lake came within six feet of dropping below the point that would have caused a water shortage. Further drops would have triggered limits on water use in the valley, but the recent increase has pushed the date of a possible shortage back to at least 2014, Davis said. 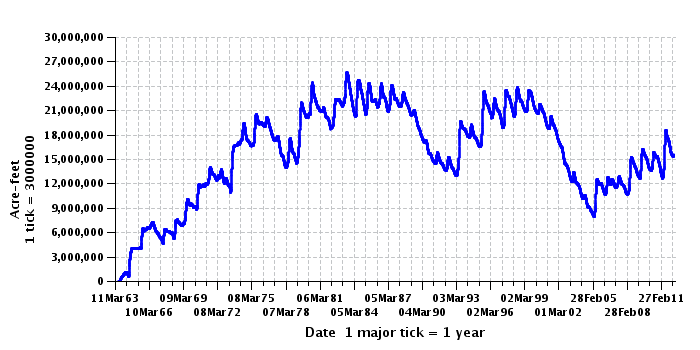 The observant reader will notice a pattern of rapidly varying water height in the Lake Mead chart above from 1935 until the mid-1960s, after which the water level became more consistent in the short term. My theory is this smoothing was caused by the fact that Lake Powell, upstream from Lake Mead, began to fill in 1966, taking 17 years to fill completely (that would take us to 1983). It is reasonable to assume the people overseeing this filling operation took more water for Lake Powell at times of rapid flow, thus smoothing out the flow peaks and troughs that were seen in Lake Mead beforehand. Since that time I would guess that Lake Powell now absorbs the annual peaks and troughs once seen in the Lake Mead data, and acts as a buffer for Lake Mead. I would love to confirm this theory, but there seems not to be a convenient monthly water level database for Lake Powell, as there is for Lake Mead. It looks to me like there is about a 10 year lag from peak temperatures in 1998-2000 to lowest lake level. Similarly, the cold of the ’60s and ’70s had the lake filling, but only reaching a peak in the ’80s. This present “colder and filling” cycle looks to have started off with a BANG! as lake level has shot up to above drought level in just a couple of years. I’d not be surprised to see a ‘pause’ in the rise as we approach this solar max (wimpy as it may be) and then a continued rise (perhaps quite rapid as in prior cycles) back to above normal levels as the cold phase PDO settles in. Which says that this particular year is a bit on the dry side, but also says that the lake is just 60 feet below “full pool” so not that much more room to rise. Glen Canyon Dam / Lake Powell –The monthly unregulated inflow volume to Lake Powell for April was 764 thousand acre-feet (kaf) (72% of average). This was 36 kaf below what was forecasted in early April. The release volume from Glen Canyon Dam in April was 606 kaf which was 6,000 acre-feet above what was scheduled for release during the month. As a result of the difference between the projections made in early April and actual conditions and operations that occurred in April, the elevation of Lake Powell at the end of April was 0.17 feet (about 2 inches) higher than projected. On April 30, 2012 the elevation of Lake Powell was 3635.76 feet above sea level (64.24 feet below full pool). So they were releasing more than was scheduled and ended up higher than projected. With 64 feet of headroom to play with. Snowpack conditions above Lake Powell have been well below average all year and are now nearly melted out. The runoff from the melting snow has been less than impressive and the inflow to Lake Powell so far has peaked at just over 15,000 cfs. It is possible that this peak could be exceeded if temperature conditions warm quickly in the coming weeks. The Water Supply Forecast for Lake Powell (April through July Unregulated Inflow Volume) has been updated for May and the forecasted unregulated inflow volume for the period from April through July for Lake Powell is now 2.36 maf (33% of average). This is the third driest May forecast for Lake Powell since these forecasts began to be issued. Only 1977 and 2002 had lower May forecasts and these years ultimately were the 2 driest water years in the historic record for Lake Powell (1963-2011). I would only note that about 1966 and 1977 are very near the only two periods of snow that I experienced in the Central Valley where I grew up. From 1953 onward, I’ve lived in or near the same area. I’ve had snow 3 times. Near (though not exactly on) those years. The implication, to me, is that low inflows to Lake Powell are exceptionally cold years in California. It looks to me like they filled the lake during a cold phase. It “wobbles” some about the inflection point, but generally drops in the warm phase (reaching a minimum in 2005, about 5 years after the peak heat year of 1998), then starts rising again as we swapped to the cool phase of the PDO. This year may be a bit low on inflow (due to exceptional cold in the mountains that get the storms first? Perhaps a check of some California lake levels would be a nice next step…) but it is in a nicely rising trend. OK, the California wet and stormy with loads of mountain snow have been getting all the news. But earlier we talked about the historical record that showed cold in the USA West also meant a rise in lake levels and a general increase in wetness. (Contrary to other parts of the world where cold means dry due to decreased evaporation and lessened water capacity in cold dry air). To me that say’s is likely going to be a very good time to start watching those western lakes that were “Drying up due to Global Warming” and potentially call some folks on the carpet about that scare mongering. So at this point I’d have to say that the lakes are recovering nicely, as expected during a cold phase, and that they had a “FAIL” on the drought doom and gloom. So we’ve got our coincident indicator of “Warming”, the drought and lower lake levels in Lake Mead and others in the area. And we’ve got our “hum dinger” storm dumping months of rain in days. As this rainy year unfolds, we ought to see the drought ended, the minor lakes filling fast, and the major lakes begin a slow multiyear climb. Easily monitored and easily tested hypothesis. Simple and direct cross check on the assertion that we’ve left a hot phase behind and entered a cooling / cold phase. Given the filling lake charts above, it looks like the “Cold and filling multiyear” thesis is being proven. Has some interesting historical notes. Including that the lowest level in the lake was in 1965 following a drought in the late 1950s. It also includes a couple of interesting graphs of lake level. Comparing those prior charts with the present chart, it looks like the prediction of a reversal to filling was pretty much ‘spot on’. Given that the intervening couple of years have had “news flow” of cold winters, the thesis of “cold and wet” is also pretty much confirmed (modulo that in exceptionally cold winters it looks like some snow gets squeezed out in Washtington / Oregon / California so Utah has a dry year). It also looks to me like North East Australia is a “wet / cold” barometer while South West Australia goes dry then. Historical droughts in China have been during cold phases. They have had a drought for the last few years. What has been called the worst drought for China’s Yunnan Province in nearly a century will persist, as there is little prospect for meaningful rainfall until May. Between six and seven months of dry winter weather is characteristic of the Yunnan Province of China, but an early end to last year’s rainy season is causing the current drought to be much worse than in previous years. A devastating drought in southwestern China’s Yunnan province is entering its third year. The drought has already affected more than 6.3 million people; 2.4 million have difficulty finding access to drinking water. Southwestern China’s agricultural industries have also been critically affected and have already lost approximately 2 billion yuan ($317 million). Farmers have had to switch to more resistant crops, but this has not alleviated many of the problems created by the drought. Families in some regions must turn to transporting water from more than 10 kilometers (6 miles) away. China has long been affected by desertification in the northern and western regions, but the drought in Yunnan marks a new high in China’s troubles with the climate and environment. In the end, history does not lie (though historians might…) and the cycle of droughts and lake levels tells us when it was cold and hot. Right now, they are saying cold. The lakes don’t lie. The drought in China does not lie. In 2012 winter wheat production volumes in Ukraine will total 8-9 mln tonnes in the terms of worst weather conditions, said Alexander Ivashchenko, academician – secretary of the department of crop production of the National Academy of Agrarian Sciences of Ukraine, on November 15. Statistics of previous large-scale droughts in Ukraine indicates that reduction of crop production may reach the level of two thirds of general grain production. Thus, Ukraine can get 8-9 mln tonnes of grains in the most extreme scenarios of weather conditions, which would be enough to fully meet the needs of the country in milling grains, he said. At the same time, A.Ivashchenko said that to date Ukraine is experiencing the third largest drought during recent 200 years: the similar situation occurred throughout the territory of the country in 1891 and 1921 only. KIEV, Feb 9 (Reuters) – A fierce cold spell has killed most of the winter barley and winter rapeseed crops and seriously damaged wheat in Ukraine’s eastern and southern regions, while threatening winter crops and slowing exports in Russia. These are the kind of cold hard facts that the Data Diddlers of GISS and Hadley will not be able to hide. It is likely time to go long wheat futures and put some extra noodles in the pantry. This entry was posted in AGW and Weather News Events and tagged Australia, China, cold, drought, Floods, Lakes, Mead, Powell, Ukraine, Utah, weather, wheat. Bookmark the permalink. One impact on the water suppy is evaporation. Colder weather = less evaporation. Gov. Moonbeam is fortunate he is not having to deal with lack of money and thirsty voters at the same time. -Isn’t it funny how Every Action Has An Equal And Opposite Reaction, another way of saying it is Every Good Deed has a Dark side. It’s like something Good, like a nice Huge dam on The Three Gorges in China, ain’t all Good; it’s only Good for this amount of things and Bad for another chunk of things. Same with Hoover Dam, the one at Lake Powell, and any/all others. Why, on the good/bad side, I’ll bet they have something to do with all the CO2 some are complaining about these days, or any number of other things too. -I vaguely recall something called the Law of Unintended Consequences, it seems to be the Equal and Opposite Thing that I’m talking about. Did you know that Dams can cause disease? Why would anyone build a dam if it didn’t do more good than harm? Why would anyone want to ‘remove’ a dam (unless it was just too unsafe)? -This is a BIG LEAP, please bear with me a moment, DAMS CAUSE GLOBAL WARMING. Honest! They do! Just look at how many of those things folks have built in the last hundred years! But, remember it ain’t all bad, Equal and Opposite, Equal and Opposite! So, let me get up on my soapbox and rant about dams…damn it! I live a about 800 miles north of E.M., we all get a large % of our power from hydroelectric dams, cheap, clean and renewable. However, the construction of many of the dams, particularly the ones along the Columbia and Snake rivers devastated the anadromous fish runs. Some dams had fish ladders to accommodate the returning Salmon and Steelhead, but many did not. Also the migrating juveniles are knocked around in nitrogen rich water as they pass thru the turbines. So they surface with a case of the bends, and then end up on the losing end of the food chain. Introduced species as well as naturally occurring species thrive in the slow moving warmer waters. Most of the dam(n) construction took part in the 20’s and 30’s, much of it part of “The New Deal”. Damn Fascist Socialist Progressives…. The utilities running the damns, both the Bonneville Power Administration as well as local municipalities, are required to pay for the efforts to maintain the salmon population near historic levels. Billions of dollars are spent directly by the utilities and these costs are passed directly on to the consumer as the costs are reflected in the rates. Additional taxes and fees are then added to the consumer. Some of these fish are listed on the Endangered Species List, so there are not many options. Add the additional costs from the Bureau of Indian Affairs. You see, the Federal Government has Treaty obligations with many of the Indian Tribes in the area. Many of the tribes have rights to half the salmon. Billions more spend to rebuild and maintain fish runs damaged by the dams. Add those cost to the federal deficit. Replace the dams with a bunch of nuclear reactors. Put them in Hanford, WA. It is already a Superfund site, and always will be. Plenty of cold water…and easy access to all the power lines. Hanford was built as part of the Manhattan Project and much of the early power production from the dams went either Hanford or the Boeing war efforts. Lots of planes needed…lots of aluminum to create…lots of power needed! Long term BILLIONS would be saved and our power rates would go down. But most importantly…the fishing would get better! The power companies have more ‘say so’ than the Corps of Engineers. When lake levels go down, they keep the turbines turning (so that money is being made), and the corps just looks the other way. That is how they do it in Georgia, so I assume it’s like that everywhere. Being a native Coloradoan, I’ve followed the Colorado River levels for years. The level of Lake Powell has been reduced due to higher use rates from Lake Mead over the years. Which, of course means Calfornicate use. Poster Sera is right in his/her observation. 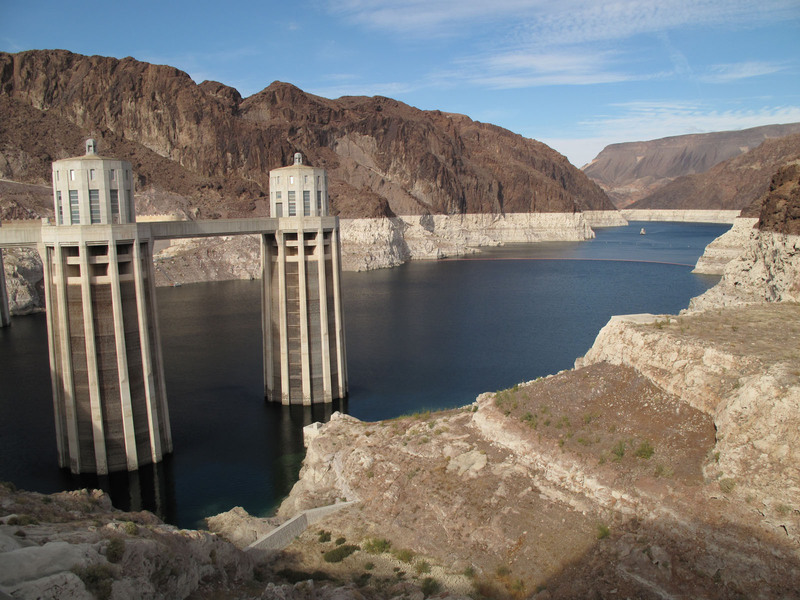 The powers’ that be made the decision to lower Powell in favor of Lake Mead about two/three years ago, obstensibly for environmental purposes, but in reality because the turbines are more efficient at mead the higher the water level. If you read the pubs from the usgs it states a ten year drought, but the data doesn’t support that statement. If you add up the numbers, which you are doing, you will find that there is no greater shortage in runoff now than there has been in the past. Last winter was a bad skiing year. This year, a new agreement reached by the seven states on the Colorado River will likely require additional releases from Lake Powell to Lake Mead. If spring runoff is high enough to trigger the so-called “equalization” agreement, it will require releases from Lake Powell sufficient to bring Lake Mead up to an elevation of 1,105 feet above sea level, according to Clayton. It currently stands at about 1,091 feet. Lake levels are useless without release data. “Full pool” level is 3,700 feet elevation (the height of the surface of Lake Powell above sea level). Goddard’s chart shows the lake hasn’t been at that level since 2000 (and it was declining for some time prior to that). Goddard’s chart shows four years of rise compared to seven years of decline. Lake Mead is a rip off. No showers, No vollyball nets, No clean beaches. Imagine that, pay to drive by. Truly illegal and corrupt. No burros, No wild horses. Lake Las Vegas is the Grand Eyesore.